By Kori ~ September 21st, 2010. The Loire Valley is Franceâ€™s third largest wine region. It is a long, narrow region that runs predominately east/west along the Loire River. The region spans about 600 miles. The Loire Valley includes 65 appellations and produces wines from over a dozen grape varieties. There is great diversity in Loire Valley wines due to its wide range of microclimates. Loire Valley wines are very food-friendly and are the most popular wines ordered in restaurants in France. 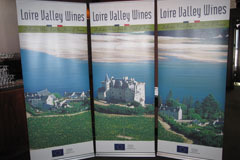 Last week, the Loire Valley Wine Bureau hosted a trade tasting of Loire Valley wines in Seattle. It was a great opportunity for Dad (John) and I to explore Loire Valley wines further. While over 100 different wines were being poured from all over the Loire Valley and made from many different grape varieties, we decided to focus our tasting on Cabernet Franc and dry Chenin Blanc. In the Loire Valley, â€œCabernetâ€ means Cabernet Franc. It was the Loireâ€™s first red grape variety, and it thrives there. Known for its earth, spice, and red fruit characteristics, Cabernet Franc is the red grape variety used to produce wines in Chinon, Bourgueil, Saumur, Saumur-Champigny, and Anjou, among others. Chenin Blanc is a white grape variety native to the Loire Valley. It is able to adapt to different microclimates and therefore is produced in a wide variety of styles, from dry to sweet to sparkling. Chenin Blanc is the primary white variety in appellations such as Vouvray, Anjou, Chinon, and Saumur. Of the wines we tasted, one Cabernet Franc and one Chenin Blanc stood out above the rest. We thought that the 2006 Domaine Jo Pithon Anjou (Cabernet Franc) and the 2009 Pierre Chainier Clos de Nouys Vouvray Sec (Chenin Blanc) were excellent. As far as value goes, the wines of Cave des Vignerons de Saumur delivered serious bang for the buck. If you have not had any or many wines from the Loire Valley, I encourage you to seek out one of these wines to help expand your palate. These wines are quite distinctive and really express the unique terroir of the Loire Valley. Hereâ€™s a breakdown of the wines that we tasted at the Loire Valley Wines event. Under each Quality heading, the wine name, grape variety, and region within the Loire Valley will be listed along with price and QPR rating. Wines in bold type received a QPR rating of 5 bangs for your buck (out of 5). Great wine region indeed! Also, don’t forget all the sweet chenin based wine like chaume. Thanks, Bottle Deck. Yes, a lot of good wine to be had in the Loire. For this tasting, though, we focused on the dry Chenins. Cheers!